Genre: FPS. Other versions: PS3; PC. Home is certainly where the war is for the US in Homefront, the newest game from Frontlines: Fuel of War developer Kaos Studios. 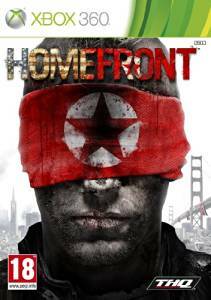 Amidst the recent craze of first-person shooters, and particularly realistic military-based ones, Homefront attempts to stand out by depicting a brutal takeover of the superpower as well as deliver multiplayer modes that try to rival Call of Duty and Battlefield. Sadly, Kaos shoot themselves in the foot with a short, generic campaign. And the solid, but by no means boundary-pushing, multiplayer component fails to salvage the game from mediocrity. Set in 2027, a military-aggressive and unified Korea, take over America following economic decline and the crashing of oil infrastructures. You take the role of Jacobs, a former military pilot who is rudely awakened by demands for re-education in an Alaskan camp. Thankfully, he is saved and soon becomes involved in a resistance movement, along with the irrational Connor and the calmer Rianna as they attempt to capture fuel supplies to help the US military. There are some genuinely shocking moments, particularly the opening sequence which depicts several brutal killings. But from there, the game never really succeeds in capturing emotional highs, and its forced ending leaves a lot to be desired. All that text could get distracting. Lucky it's not an important moment! Homefront’s campaign is pretty by-the-numbers. Taking place across seven levels, which all could be completed in four hours, you are mostly shunned down linear levels, with your main objective being kill any Korean soldier blocking your path. There’s other objectives thrown in for good measure, such as defence sections, but it still boils down to killing everything. There’s even a vehicle level thrown in for good measure, though it’s interesting because you gain full control of the vehicle in comparison, but it’s a shame this only consists of one level. There’s nothing particularly stand-out about Homefront’s campaign, especially when combined with a mediocre narrative, but it never feels truly awful. It’s a competent shooter; complete with good aiming mechanics, fairly decent A.I. on the harder settings and some exciting moments, yet it never really rises above merely average. And the multiplayer, while stronger, isn’t exciting enough to warrant interest over its competitors. Perhaps most interesting is the 32-player sized games, and more impressive is the fact multiplayer games are completely stable despite how many players are pit into a lobby. But from there, it feels similar to its rivals. There’s a mere two modes – team deathmatch with 16 players and Ground War, the 32-player mode which tasks two teams with capturing three different points for multiple rounds. There’s also a lot of customisation in terms of classes, as you can take assault, sniper and other setups, along with vehicle variations of these load outs. The scale of battle is widened by the inclusion of tanks and air vehicles, but it’s a shame there’s only two modes, as it can feel stale after a few hours of gameplay. Homefront scores for its visual presentation. Though it can be technically deficient, mainly due to a dated Unreal engine, there are many visually impressive moments that add to the feeling of war. A shocking scene with White Phosphorus that goes horribly wrong, a derelict Mall and the outlandish camp which falls into neither side of the war are genuinely impressive sights. Characters look pretty detailed, though environments feel dated in some spots, and the frame rate is usually very smooth. Audio isn’t quite as strong: poor writing and stiff dialogue, with extremely awkward moments of pauses, combine with a saccharine, patriotic soundtrack which feels forced to make a mediocre-sounding game, though the guns sound appropriately strong. Homefront lacks the courage to stand out from its contemporaries, instead remaining a solid but unremarkable shooter. Nothing will cause any raised eyebrows, yet there’s also a lack of truly stand out moments bar some shocking depictions of war. Its generic campaign can be blown through within four hours, and though harder difficulties intensify the challenge, it’s nothing we haven’t seen from other shooters. The multiplayer is stronger, but it still feels inferior compared to its competitors with a lack of modes and mostly derivative ideas. It’s crafted with enough polish that those not expecting the next best shooter will gain some enjoyment from it, but anyone who wants more than satisfactory will be left wanting more, especially from the rushed ending. "Its generic campaign can be blown through within four hours... ​Homefront lacks the courage to stand out from its contemporaries, instead remaining a solid but unremarkable shooter."